The popular CRKT Eat'N Tool XL is a larger version of the original from designer Liong Mah. For those of you hoping for a slightly bigger version, here it is! The Eat'N Tool® XL offers a larger spoon and longer handle surface to grab hold of. 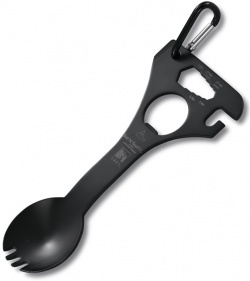 Use it as a spoon, or fork, to prepare and/or eat your favorite meal, but its also got a load of other handy tools. Includes a box wrench, driver/pry tool, can opener and bottle opener. It also comes with a carabiner (non-weight bearing) for attaching to gear and self.